Authors: Salem, R.; Ahmadi, A. A.; Tudury, G. E.; Carter, G. M.; Murphy, T. E.
Abstract: The authors describe the design and performance of an ultrafast optical clock recovery system that is based on two-photon absorption (TPA) in a silicon avalanche photodiode. 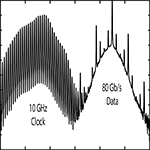 Unlike many other optical clock recovery techniques, the system is shown to be polarization insensitive, broadband, low jitter, and scalable to high data rates. Moreover, the system is simple, economical, and suitable for integration with silicon electronics. Successful operation of the system is reported for speeds up to 80 Gb/s and transmission distances up to 840 km using a recirculating loop. The authors introduce a new dithering detection scheme that dramatically improves the dynamic range and decreases polarization and wavelength dependence, without introducing an additional timing jitter. The system achieves a dynamic range of 10 dB and optical bandwidth exceeding 35 nm.